There's More Secret Money In Politics; Justice Kennedy Might Be Surprised : It's All Politics Outside groups are playing a powerful role in the presidential election, and some of them disclose nothing about their donors. That's despite what the author of the Supreme Court's controversial Citizens United ruling seemed to anticipate two years ago. Justice Anthony Kennedy, who wrote the Citizens United opinion saying that corporations can pay for ads expressly promoting or attacking political candidates. Federal election law has required the public disclosure of campaign donors for nearly 40 years. But this year, outside groups are playing a powerful role in the presidential election. And some of them disclose nothing about their donors. That's despite what the Supreme Court said in its controversial Citizens United ruling two years ago. 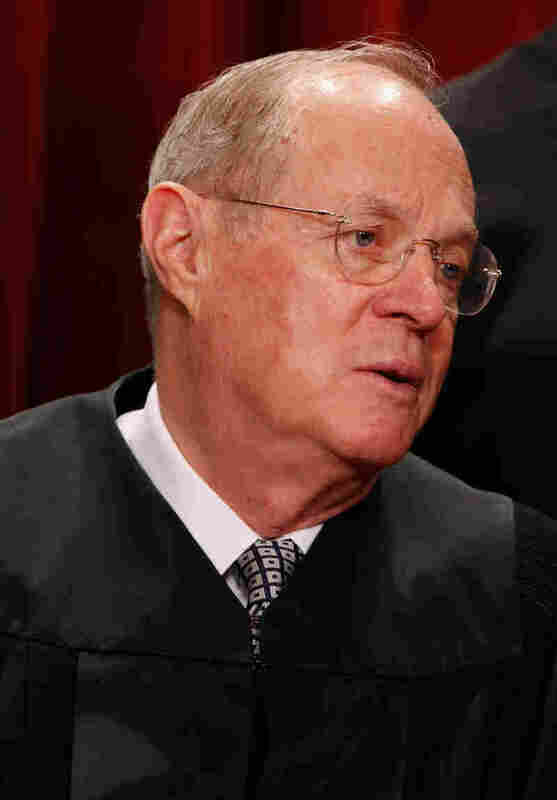 Justice Anthony Kennedy wrote the Citizens United opinion, which said that corporations can pay for ads expressly promoting or attacking political candidates. "Political speech is indispensable to decision making in a democracy and this is no less true because the speech comes from a corporation rather than an individual," Kennedy said in a 9 1/2-minute summary he read from the bench. But that wasn't the whole decision. The nonprofit corporation called Citizens United, which had released a documentary critical of then-presidential candidate Hillary Clinton during the 2008 presidential race, had challenged the disclosure requirement, saying it wasn't helpful to the public. "We reject Citizens United's challenge to the disclaimer and disclosure provisions," he said from the bench. "Those mechanisms provide information to the electorate. The resulting transparency enables the electorate to make informed decisions and give proper weight to different speakers and different messages." officials accountable for their positions and supporters. making profits, and citizens can see whether elected officials are 'in the pocket' of so-called moneyed interests." And Kennedy brushed off Citizens United's other argument — that disclosure put its donors at risk. "If an association offers evidence that its members will face threats or reprisals, it may be able to show that the disclaimer and disclosure requirements are unconstitutional as applied to that association, but Citizens United has offered no evidence here of threat or reprisals," he said in summarizing from the bench. But despite what Kennedy said, secret money has become the real growth area in campaign politics. Crossroads GPS, co-founded by Republican strategist Karl Rove, joined with a handful of other conservative "social welfare" organizations, spent more than $30 million on ads attacking President Obama through the end of May. Crossroads then announced a new ad buy of $25 million. Tax records show that its donors have included between a dozen and two dozen contributors of at least $1 million each. A couple of the contributors gave as much as $10 million. This handful of anonymous donors accounted for nearly 90 percent of all the money raised by Crossroads GPS in 2010 and 2011. So what about Justice Kennedy and his call for effective transparency? "I think what Kennedy was talking about was sort of the almost platonic view of disclosure, that people will receive this information and make some sort of rational decision about what to do about it," says Bill Maurer, a lawyer with the conservative legal group Institute for Justice. Maurer, who wrote his group's amicus brief in Citizens United attacking the disclosure mandates, says modern reality isn't so platonic and that donors face everything from personal threats to corporate boycotts. "I think that there is a rather transparent attempt to use disclosure laws to bully people into silence," says Maurer. Zephyr Teachout, a Fordham University law professor, says that American politics traditionally favors public and disclosed speech and debate and this assault on disclosure is something new. "I think disclosure is extraordinarily important. If you don't actually know how power works in a society, it's next to impossible to work with it or fight it, depending on what you want to do," says Teachout. Critics of disclosure say its value to voters is marginal. Teachout says when it comes to political advertising, voters actually want to know "whether those attacks are funded by Goldman Sachs, by a union, by Exxon Mobil. If you knew where the source of that attack came from, it changes how you read the attack." The debate will grow louder as more legal challenges to disclosure are filed. Meanwhile, voters this year will see more ads than ever before financed by six-figure, seven-figure and maybe eight-figure contributions from anonymous donors.